Mechanical upgrades: Pre-sale home inspection available. 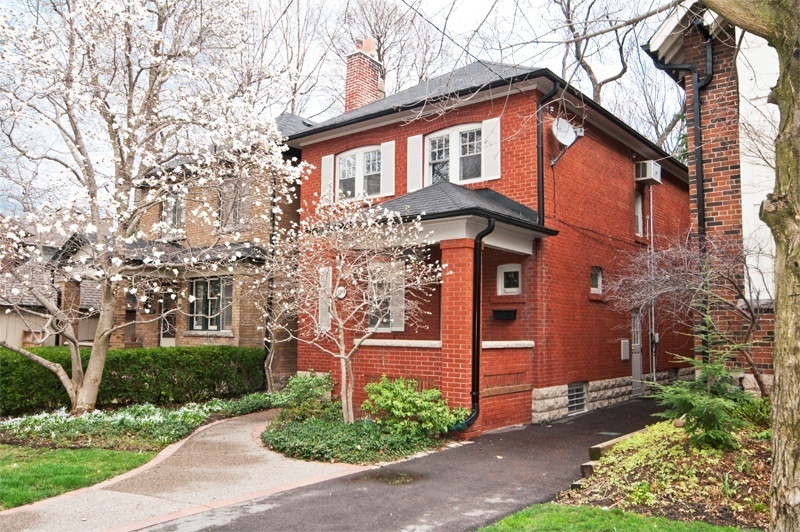 Classic family home on premium street in this coveted established pocket of the city known as Chaplin Estates! Updated detached 2 storey, 3 bedroom home on gorgeous 30 x 130 foot lot with private drive – parking for 3 cars! Opportunity to move right in or build/expand/customize to your taste. Spacious character home with well-appointed principal rooms. Inviting living room with a wood-burning fireplace . Host lavish dinner parties in the elegant dining room. Upgraded eat-in kitchen with granite counters and stainless appliances. Walk-out to the back deck and spectacular gardens! Plenty of privacy & yard for kids, dogs & entertaining even if a new large addition off the back is built. Finished lower level with a recreation room, 3 piece bath and tons of extra storage space for all your kids “stuff”! Separate side entrance for potential nanny suite. Superb school district attracts many families from all over. Oriole Park Jr. P.S., John Fisher French Immersion, Glenview Senior P.S., North Toronto Collegiate. Excellent proximity to private schools such as BSS, UCC, St. Clement's & Havergal. Every amenity at your doorstep! Walk to Yonge & Eglinton, shops, stores, restaurants and subway. Friendly neighbourhood spirit with a true sense of pride and ownership! An incredible environment to raise your family! Shopping a plenty! Residents are within walking distance of a splendid mix of fine boutiques, an array of trendy restaurants, specialty stores, coffee shops and large grocery stores, along Eglinton Avenue West around Avenue Road and the buzzing Yonge Street. Enjoy movie night at the SilverCity in the Yonge & Eglinton Centre. Lots of local recreation! The ultra-modern North Toronto Community Centre has an indoor and outdoor pool, water slides, a gymnasium, a walking track, and exercise rooms. Eglinton Park is adjacent to the community centre. Its facilities include: a baseball diamond, tennis courts, a wading pool and an artificial ice hockey rink. Renowned School District! Oriole Park Jr. P.S., John Fisher French Immersion, Glenview Senior P.S., North Toronto Collegiate in the public system. Nearby prestigious private schools such as Bishop Strachan School, St. Clement's School & Upper Canada College. Plenty of neighbourhood daycares… Busy Little Beez, Upper Yonge Village Day Care Centre, Treetop Day Nursery to name but a few. Go Green! Walk to Eglinton subway station – a hub for bus routes all over the city or catch a bus on Eglinton Avenue or Oriole Parkway. 119 Eastbourne Avenue ~ Attractive red brick exterior façade and inviting covered front porch to greet neighbours or give out candies @ Hallowe'en! Many impromptu gatherings with nearby neighbours happen throughout the year. Safe fun-filled community with kids playing road hockey, learning to ride their bikes or just out for a walk with the dog! Greet guests in the spacious front foyer with 2 decorative stained glass windows, and halogen lighting. Original charm & character – baseboards, door and window trims etc is meticulously maintained throughout. Main floor hardwood floors have been replaced with quality strip hardwood. Fashionable living room will host many large family gatherings. Front facing picture window floods the room with light. Wood-burning fireplace and mantle with custom marble surround. Pristine hardwood floors , crown mouldings and halogen spot lighting for art. Gracious dining room with a swinging butler door to the kitchen makes entertaining delightfully easy. Wainscoting, hardwood floors and pretty window overlooking the back garden! Eat-in galley kitchen is well laid out. Built-in granite breakfast bar and matching counters, stainless steel appliances, sliding doors lead out to the back deck, ample cupboard/ counter space and additional pantry closet, mirrored backsplash. Close off the mess with separate swing door off the foyer! Spacious second floor landing is a preferred layout. Berber carpet and linen closet. Oversized master bedroom sanctuary! 2 sets of front facing windows, wall to wall built in wardrobe closets plus additional closet, hardwood floors and deep baseboards. 2 large bedrooms face the back both with closets, hardwood floors and pretty picture window! 4 piece family bath decorated in fresh cool tones with a pedestal sink and floor to ceiling glass block window completes this level. Full lower level is a comfortable spot for kids to play, relax and watch movies. Under-stair storage is a bonus! Cosy family recreation room with carpeting. Huge work shop/utility room for the handy one of the house. Additional games room, work out area or home office area or block off for guest/in-law or nanny bedroom for whatever suits your families needs. Broadloom throughout and 2 sets of windows! Spacious updated 3 piece bath with enclosed shower stall, pedestal sink and tiled floor. Family sized laundry room adds lots of extra of storage room. Enchanting manicured front and back gardens! The 3 magnolias in the front are always the first to bloom in the neighbourhood. Many people stop to admire each year! Enjoy entertaining and dining in the spring/summer months in the serene back yard & huge party deck. The garden is so beautiful and private when in full bloom. Storage shed for all your bikes, supplies and gardening tools. Tasteful decorating and updates while maintaining the classic character and charm of the home leaves nothing left to do but move in, add your personal touches and enjoy!